Shaw has the capacity to design and construct major irrigation schemes delivering up to 45ML per day of water to farmers during peak irrigating times. Shaw has delivered a significant number of the major irrigation schemes that have been developed over recent years by the Tasmanian Government as priority infrastructure for the State. The Shaw team has the capacity to work effectively with clients and key stakeholders to ensure all project outcomes are identified and delivered to all expectations. Shaw Contracting was awarded the $8.6million dollar Winnaleah Irrigation Scheme Augmentation (WISA) in June 2011.This design and construct project more than doubled the existing irrigation scheme through sourcing additional water from the existing Frome Dam, designing, installing and connecting approx. 11km of new pipeline from the dam and joining the existing scheme north east of the township of Winnaleah. 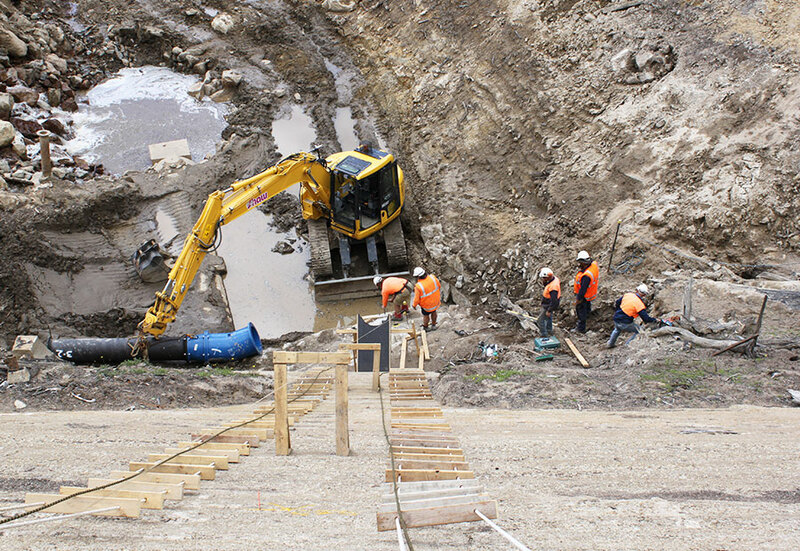 This project also involved the upgrading of the wave wall and outlet spillway at the Frome Dam. The project experienced construction and environmental challenges; being completed in a remote area and subject to extreme weather changes but also offered scope for innovation and flexibility. Originally, a 200m section of the pipeline was to be above ground as it skirted the rocky Moorina Hill; however changes to design and some careful blasting allowed this section to be buried also. Heritage issues included running the pipeline 1.5km along the alignment of a disused rail corridor, and the protection of an historic grave site, which lay just metres from the dam wall, believed to be that of a worker who died during the dam construction in the early 1900’s. 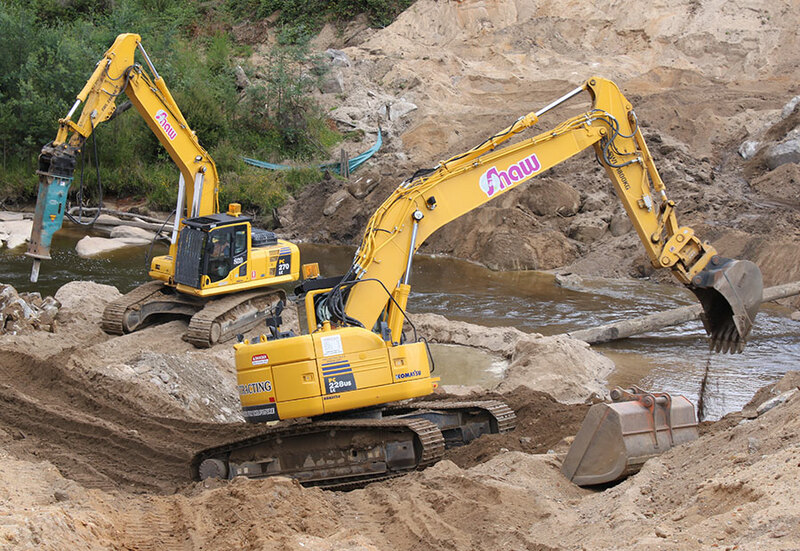 Environmental challenges on the job ranged from land protection through to land rehabilitation and remediation, restoration and river protection whilst completing the pipeline river crossing. 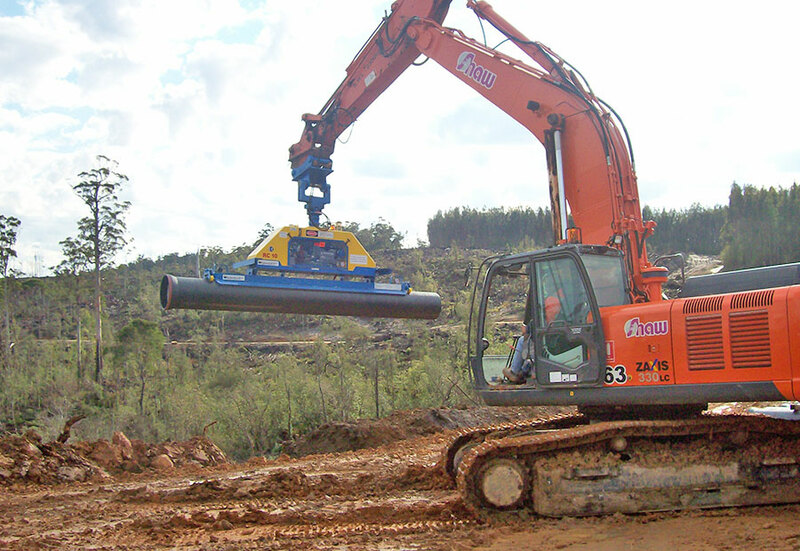 Purchasing two vacuum pipe lifters enabling workers on site the ability to off-load from shipping containers with added safety, as well as load another Shaw innovation – a specially adapted articulated dump truck for the transportation of the pipes along the alignment. Conversion of an articulated dump truck for final delivery of pipes to the pipe corridor rather than the traditional method of ‘walking’ excavators while slinging pipes one at a time. 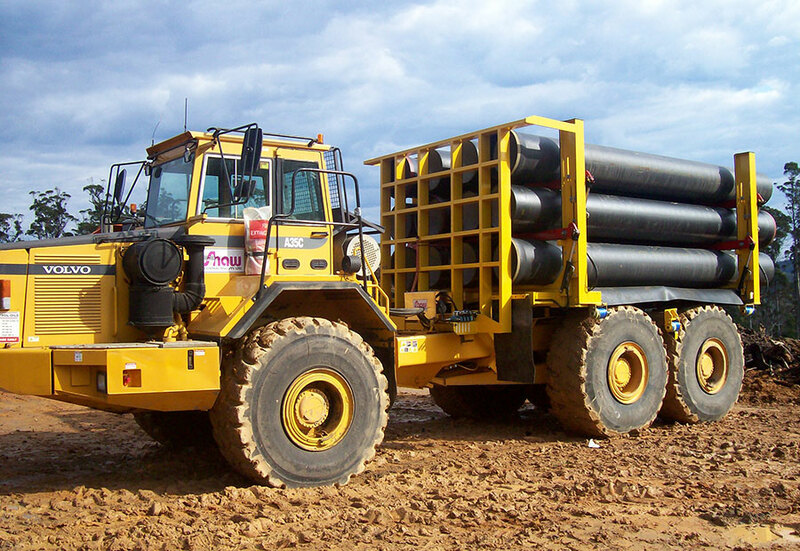 Modifications included hydraulically operated locking arms, allowing nine pipes at a time to be transported along narrow, rugged construction corridors and, saving time and money whilst protecting the environment. These modifications were undertaken in Shaw’s own workshops. Shaw designed a ‘coat-hanger’ style, steel spreader which could lift the whole pipe, allowing for the plastic sleeve to be wrapped around the pipe and then lowered directly into the shaft – all in one operation. Again constructed in Shaw’s own workshops, this significantly sped up the laying of the pipe when combined with other initiatives. A helicopter was used to lift 1.25 tonne concrete blocks for a new wave wall along the top of the dam. This method proved to be quick, and much safer than normal methods of using a crane, which would have needed extensive concrete foundations to be added to the dam floor. 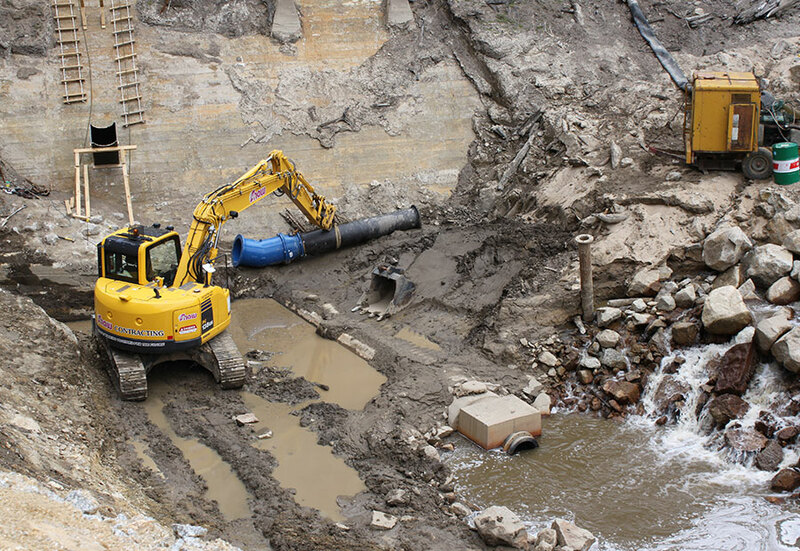 This project was completed in time for the new, larger dam and reservoir to be filled by the winter rains ahead of the 2012 – 2013 growing season largely due to the team work and innovations of Shaw Contracting, enabling schedules to be met despite weather interruptions. The completion of the augmentation extended the WISA capacity to 3,700ML and also extended its range by providing 4 additional branch lines from both the new pipeline and existing network, which greatly benefits the farming communities of Branxholm and Winnaleah. 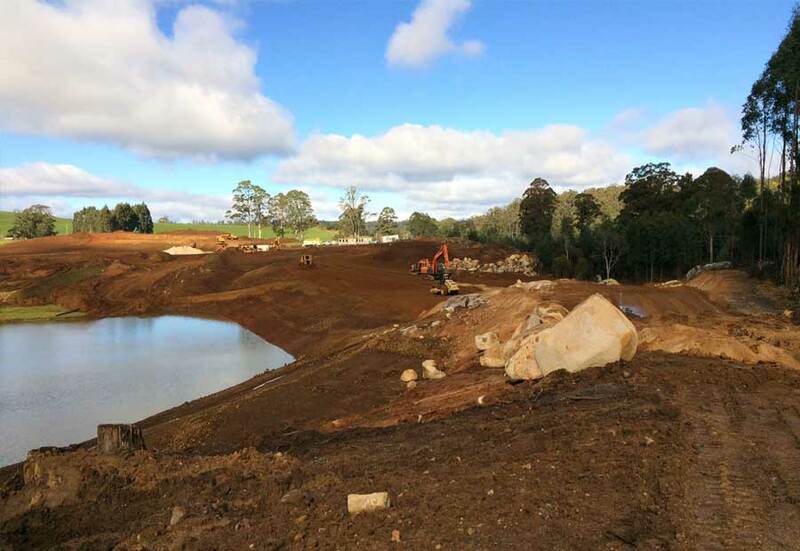 Design and Construction of a 4000ML storage dam, 2 pump stations and 42km of irrigation pipework from South Riana to Penguin on Tasmania’s North West Coast for Tasmanian Irrigation and 45 local farmers in the irrigation district. 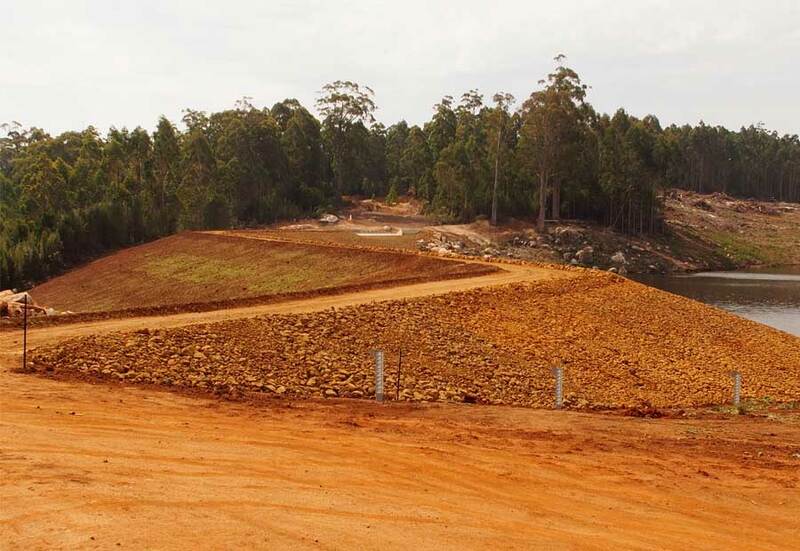 Shaw Contracting worked closely with the design team to optimise the design for both the 18m high earth filled dam wall and the 42km of distribution network immediately after award of the contract to ensure that when works commenced the field staff had all the tools necessary to undertake the works in a continual progressive system. 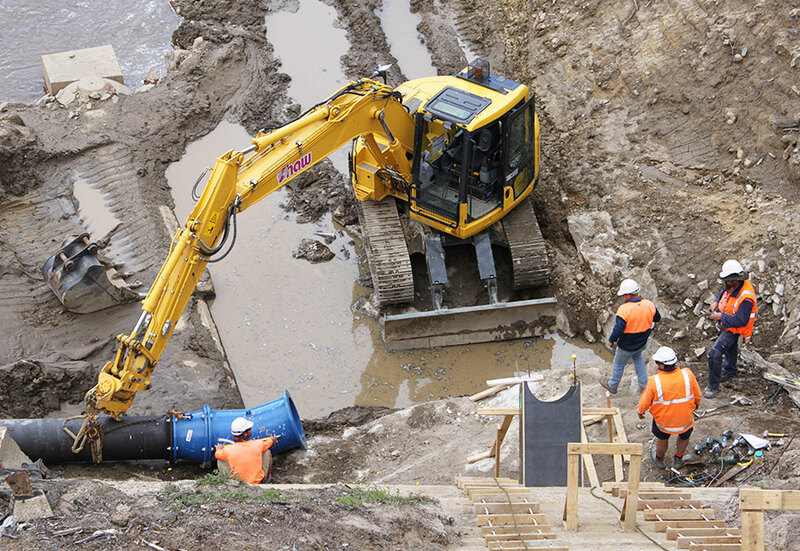 With over 80 different properties to traverse, stakeholder management was paramount to Shaw to ensure continual works along the pipeline with no delays or disruption. The construction period for the contract commenced in May 2014 and was due for completion in February 2015, which forced a considerable amount of the project to be completed over the winter months, including the construction of the dam wall in an existing waterway. The dam wall was constructed and started catching water by September 2014 and was completed by December 2014 which enabled a large volume of water to be stored during the last quarter of 2014 enabling Shaw to undertake pipeline commissioning and delivery of water to some farmers late in the 2014-2015 irrigation season. The final sections of distribution pipework were installed in February 2015 and the commissioning of the scheme was completed in March 2015 ready for delivery of water to farmers, as planned, late in the 2014-2015 irrigation seasons. 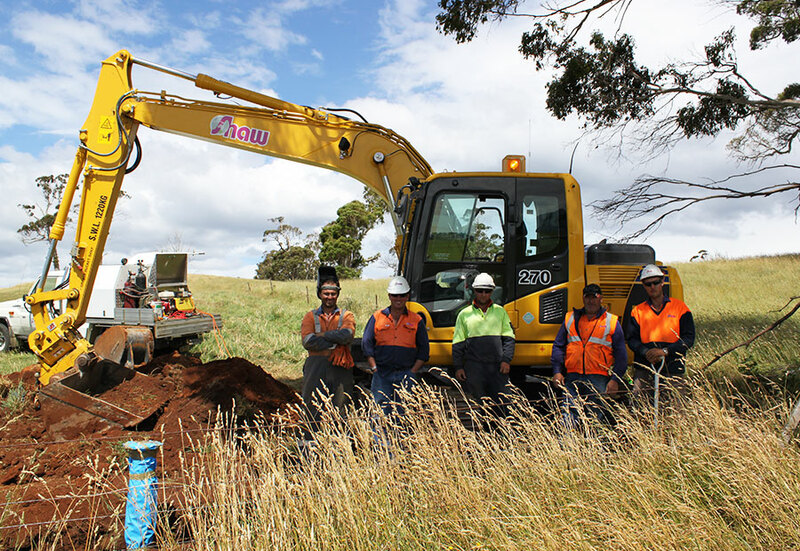 Shaw completed a total of 46 road and stream crossings on this project utilising directional drill technology with a single installation of 355mm pipe, 70m long under a swamp which considerably reduced the environmental impact on the project site. The project involved 47,000 man-hours on site both LTI and MTI free which is a successful outcome from a project safety perspective. This contract involved the design and construction of 12km of irrigation pipeline from the Meander River to the Rubicon River. Pipe was designed to provide 45 mega litres per day to three watercourses and 12 farmer outlets. To construct the pipe during winter months to meet irrigation season. 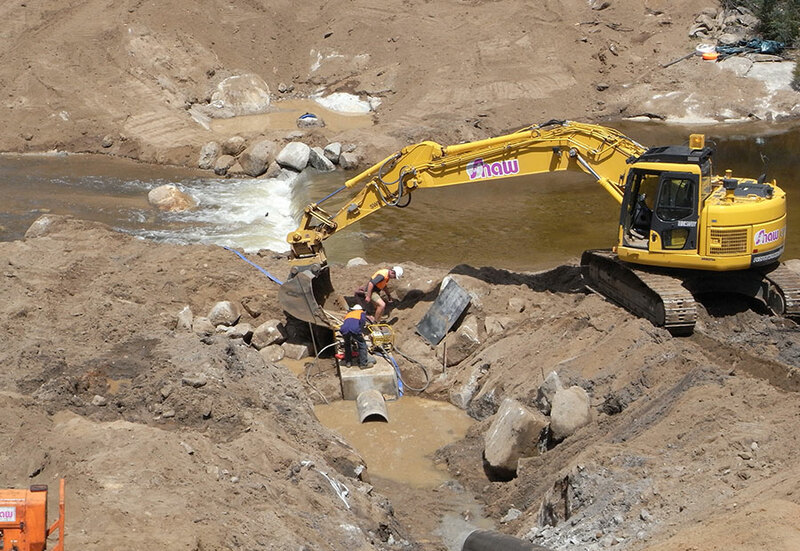 To construct the intake for the pump station in the Meander River. Manage landowner requirements and heritage issues. Meet Client’s design requirements in a cost effective manner. Ensure material lead times did not delay project milestones. Pipe was constructed successfully meeting all design flows.